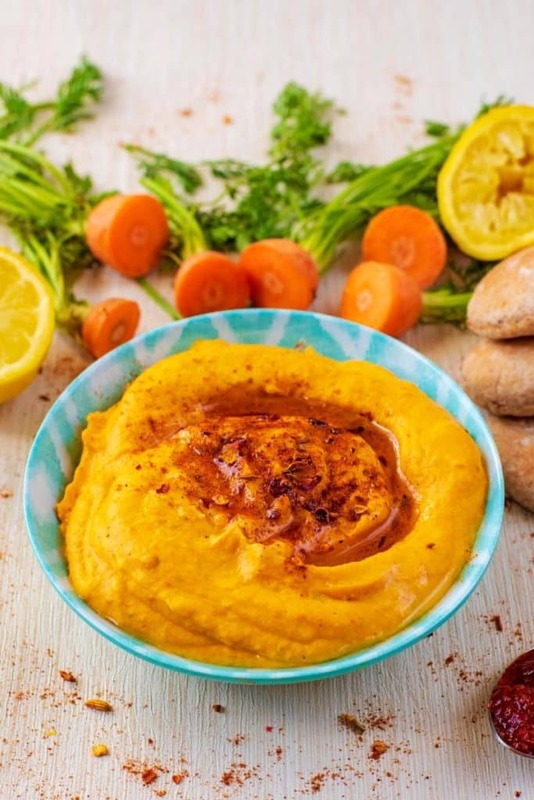 Hummus is a great snack when paired with some vegetables sticks and pita bread, but why not add some vegetables to it with this Carrot hummus! Some added vitamins and it makes it a wonderful vibrant orange colour too. This would stand out on a party food table. 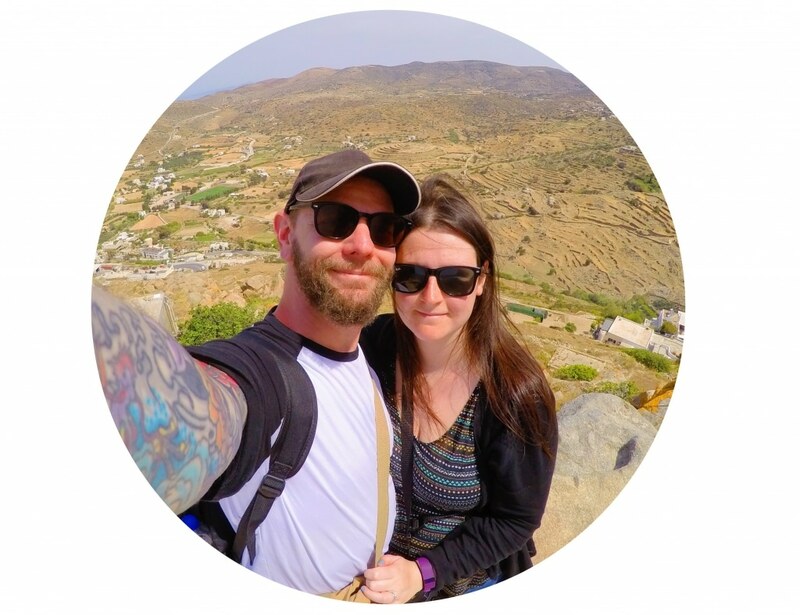 We eat a lot of hummus, and our toddler loves it too, so we are always looking for new flavours to add to it and ways to give it a veggie boost. When we were doing baby led weaning, hummus was a favourite and we added in vegetables wherever we could so that Avery was getting a portion of vegetables with every meal and snack. We tried spinach hummus, beetroot hummus, courgette hummus, but this roasted carrot hummus was the favourite because it was nice and sweet. Whilst we try to eat raw vegetables as much as possible, there is no denying that roasted vegetables are the best. They make them nice and soft on the inside and creamy on the inside, and they really bring out the flavour. 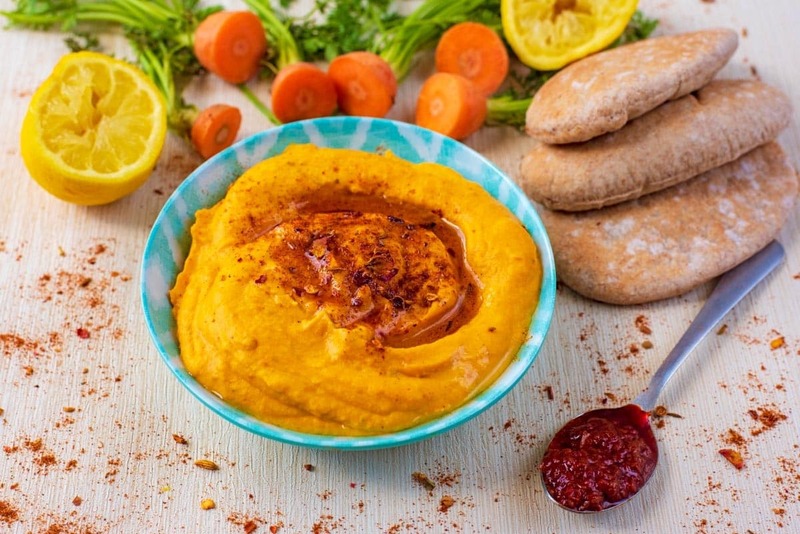 You could use raw carrots in this carrot hummus, but it would totally change the texture. Using roasted carrots makes this hummus lovely and smooth and creamy, so it is definitely worth roasting. The carrots do give this hummus a lot of flavour, but we could always do with some more flavour in our lives, right? We blended some harissa in to the hummus and then once it had been put in a bowl, we added a drizzle of good quality olive oil and then a sprinkle of ras el hanout, to make Moroccan Hummus. Not heard of ras el hanout before? You need some in your life! It’s a North African spice blend that is made up of cumin, coriander, cinnamon, ginger and turmeric. Hummus is a really healthy snack option. You have protein from the beans/chickpeas, some healthy fats from the olive oil and tahini and then this has a healthy boost with the carrots too. Make this an even healthier snack by serving it with loads of vegetables sticks. We usually go with some carrot, cucumber, celery and bell peppers. Then some torn up pita bread on the side. How Long Will Hummus Keep For? 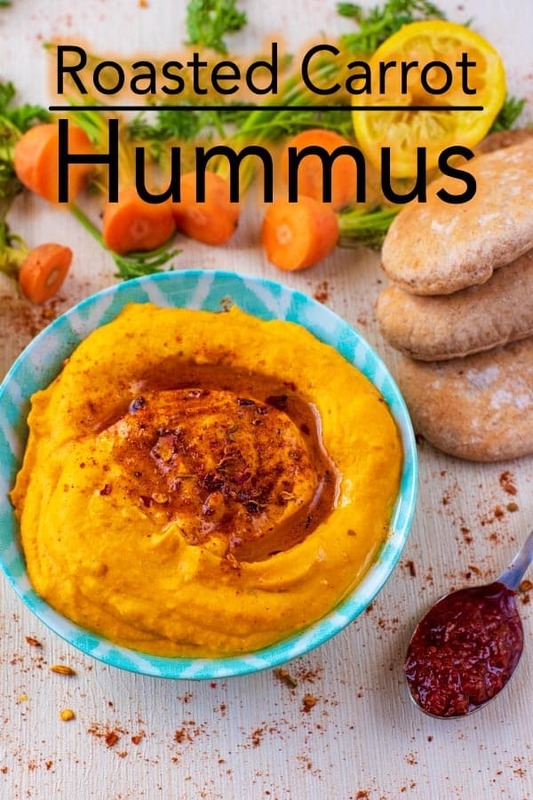 You can roast the carrots ahead of time if you are making this for a party, but the hummus itself is best blended up just before you will be serving it. Hummus can start to dry out a little after a while, so this is best enjoyed right away. One: Peel and slice the carrots and put them in a baking tray with 1 tbsp of olive oil. Two/Three: Put them in the oven at 200°C for 25 minutes until roasted. Four: Put all of the ingredients (apart from the ras-el-hanout and rest of the olive oil) in a food processor with the roasted carrots and blend until smooth. Five: Put the hummus in a bowl and drizzle with the rest of the olive oil and the ras-el-hanout. We used cannellini beans because it’s what we had in the cupboard, but you can use chickpeas to keep it a more traditional hummus. You can use this recipe to make other kinds of vegetable hummus too, like beetroot or courgette. Feel free to experiment with flavours in this hummus – you could give it a Mexican twist by using Mexican seasoning. Serve the hummus with vegetable sticks and pita bread. 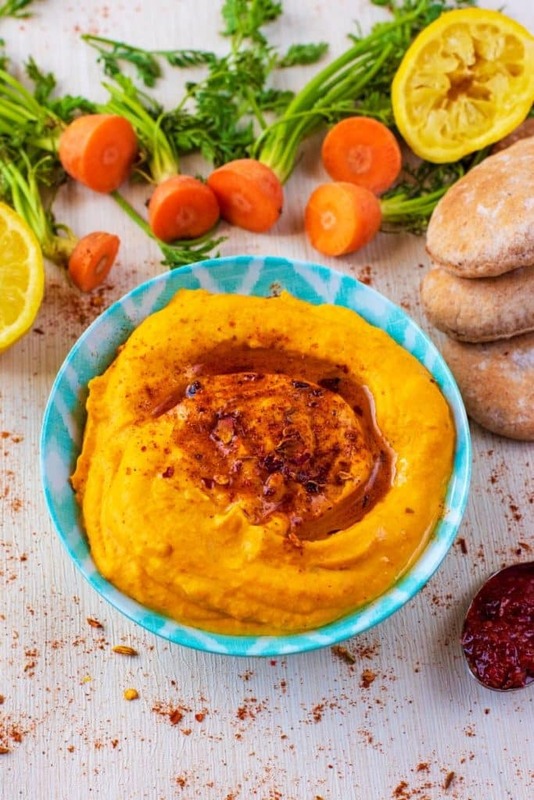 Do you want to be kept up to date on more delicious posts like this Roasted Carrot Hummus? Please subscribe to the blog mailing list (it takes 30 seconds). 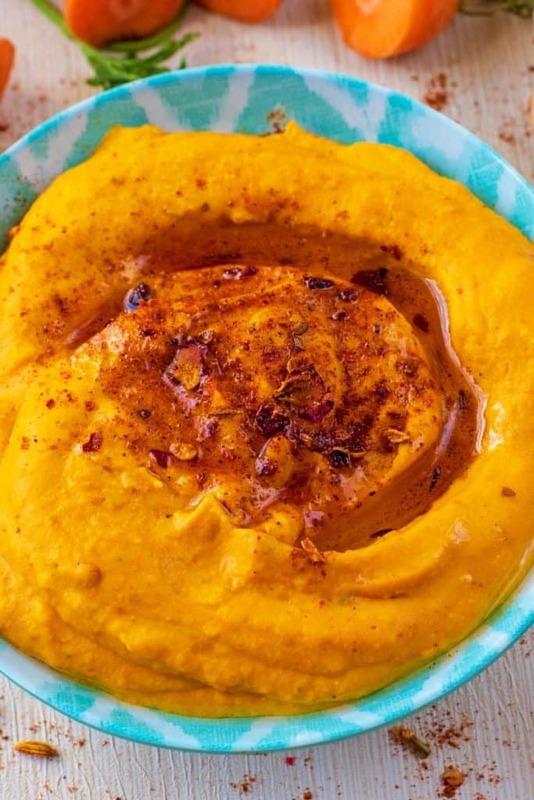 If you’ve tried this Roasted Carrot Hummus, or any other recipe on the blog, then let us know how you got on in the comments below, we love hearing from you! You can also FOLLOW US on FACEBOOK, TWITTER, INSTAGRAM and PINTEREST to see more delicious recipe ideas, behind the scenes shots and also what we are getting up to. 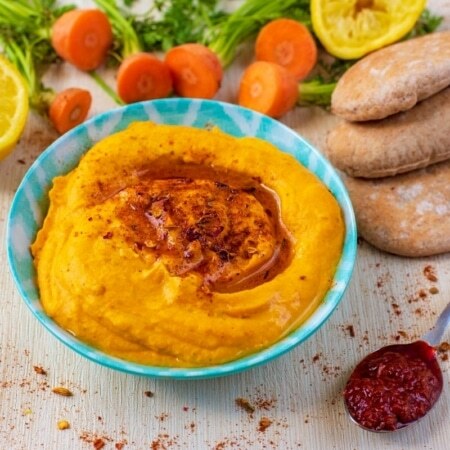 Hummus is a great snack when paired with some vegetables sticks and pita bread, but why not add some vegetables to it with this Carrot hummus! Some added vitamins and it makes it a wonderful vibrant orange colour too. Peel and slice the carrots and put them in a baking tray with 1 tbsp of olive oil. Put them in the oven at 200°C for 25 minutes until roasted. Put all of the ingredients (apart from the ras-el-hanout and rest of the olive oil) in a food processor with the roasted carrots and blend until smooth. Put the hummus in a bowl and drizzle with the rest of the olive oil and the ras-el-hanout. We used cannellini beans because it's what we had in the cupboard, but you can use chickpeas to keep it a more traditional hummus. Feel free to experiment with flavours in this hummus - you could give it a Mexican twist by using Mexican seasoning. This hummus sounds so flavourful! I love that sweet carrots are in it with flavourful harissa and ras el hanout. Oh wowzers, what a glorious colour. I’m such a traditionalist with hummus I tend to stick to the classic. But I’m seriously tempted by this, if for nothing else than that amazing orange. I have to admit, carrots are not my favorite vegetable. But they are SO good for you. I think this would motivate me to eat more of them. I’ve never had carrot hummus but it sounds delicious. I can’t wait to make this healthy snack for my family! I love that you used carrots for this hummus recipe. The color is fabulous. My family loves hummus, and once we tried this recipe, it quickly became our favorite! So good! What a great idea to make hummus out of roasted carrots. The color is gorgeous and I’m sure it adds so much flavor. I love roasted carrots, it brings out all the sweetness. This recipe looks like a real winner. I’m a big fan of hummus, and adding extra flavours is all part of the enjoyment. Such a good dish to enjoy so many different ways. Your carrot hummus sounds delightful, and the colour is amazing. Perfect for all kinds of dipping. Now this is a hummus I definitely need to try! It looks delicious and a great way to use carrots.